In 1964, the first human ventured to fly in the vertical airstream of a horizontally installed airplane propeller – the birth of Bodyflying. Technically Bodyflying is the flight in an artificially generated, vertical airstream whose power is strong enough to hold a human body in the air. Bodyflying is the movement of the body relative to the airstream. By changing the body position a person learns to masters the wind power and depending on the body tension rises or drops in the airstream and incorporates the basics of flying. In fact, Bodyflying is a new sensation and great fun for people of any age, gender and physical condition. Learning the basics of flying – rising and dropping, right and left turns – does not call for any special skills and generally is as easy as learning to cycle on a bike. In its traditional form, Bodyflying is exercised in so called “Outdoor”-facilities. Outdoor facilities consist of an open net-protected fan, generating a vertical, open airstream. The net is surronded by protective cushions as persons may involuntarily drop or fly out of the airstream. In order to enhance the otherwise relatively low uplift flyers usually wear large suits in outdoor facilities. Indoor facilities further qualify as professional training centers for skydivers. 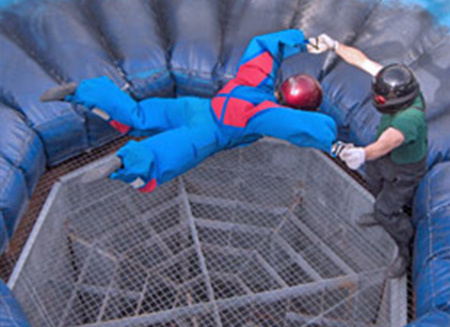 Freefall is authentically simulated in such facilities. In addition to belly flying, high quality indoor facilities allow for training of all available freefall positions from sitfly over stand-up to headdown flights. Indoor Skydiving opens up a wholly new world of motion. 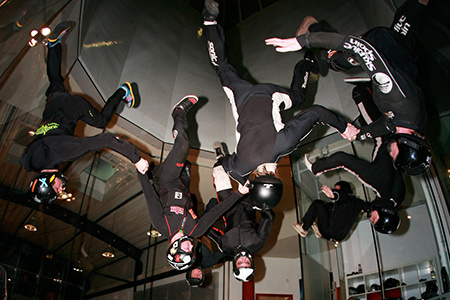 Indoor Skydiving requires and encourages coordination, concentration, physical flexiblity and endurance.